Definition: What was a Horse car? The Horse car was an early form of streetcar that was drawn by horses that ran on iron tracks laid in city streets and used for public transport. What was an omnibus? An omnibus was a horse-pulled vehicle (large city version of a stagecoach) which was also used for public transport but ran on dirt, stone or gravel roads. The Horse car followed on from the omnibus. The trolley car, streetcar or tram were wheeled vehicles that ran on rails and were propelled by electricity instead of horses. 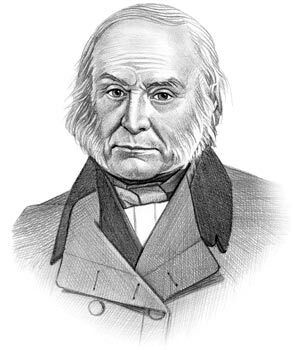 John Quincy Adams was the 6th American President who served in office from March 4, 1825 to March 4, 1829. One of the innovations in transportation during his presidency was the introduction of the Horse car. The problem with the omnibus was that roads were invariably rough and bumpy. It then occurred to someone that it would be better to lay down flat, wooden rails and then to place a rim, or flange, on the wheels that would keep the vehicle on the rails - the idea of the horse car and the rail track was born. Rails reduced friction and increased efficiency and comfort. Strips of iron were then laid on top of the wooden rail tracks for durability. The horse car first appeared in America in the early 1830's. John G. Stephenson was an American omnibus builder who worked in New York City. John G. Stephenson started his own business in May 1831, that he called the John Stephenson Company. His omnibus building business was successful and his vehicles were used on the streets of New York. It was an exciting time, the era of the US Industrial Revolution. The steam locomotive had been invented by George Stephenson and the American Railroads and rail networks were just being established. The New York and Harlem Railroad was one of the first railroads in the United States. The New York and Harlem Railroad company wanted to introduce a street carriage on rails (pulled by horses) to New York City. John Mason was a bank president and also the president of the company. In 1832 John Mason gave an order to John G. Stephenson to build the first horse car. 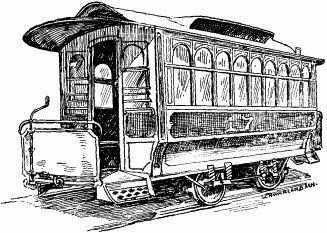 The First Horse Car for kids: The "John Mason"
The New York and Harlem Railroad company had been granted a charter authorizing a route for a horse car line from Fourth Avenue and the Bowery north in Lower Manhattan to the Harlem River. 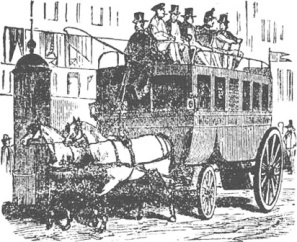 John Mason had envisioned a new kind of omnibus, one that run on rails like a railroad, but laid in the street. John G. Stephenson started to work on a design for the first horse car - he would name it the "John Mason". As can be seen in the above drawing, the "John Mason" horse car were divided into three compartments. Each compartment was designed to carry 10 passengers. The compartments looked a bit like three stage coaches fastened together! John Stephenson built the body and constructed the floors as drop wells between the wheels. He was issued a patent for his idea in April 1833. The New York and Harlem Railroad was formally opened on 26 November 1832 and the first horse car started the public transport service running on the iron tracks that had been laid in the streets. The Horse Car was an immediate success and soon spread to other large cities such as Philadelphia, Boston and New Orleans. News of the horse car spread to Europe and they appeared in London and Paris. Smaller towns and cities in the United States also liked the idea and horse car lines appeared across the country. The design of the horse car developed and gradually became to look like a horse-drawn railway carriage that was pulled by horses. At the height of its success in the 1880s there were approximately 18,000 horse cars in operation in the United States. The popularity of the horse car declined as new technology was developed. The old horse cars were first converted to use steam engines and then electricity, using a battery-powered Julien electric traction car. The wheeled public transport vehicles, that ran on rails and were propelled by electricity instead of horses, came to be known by a variety of names - the streetcar, the trolleybus and the tram. The info about the Horse car provides interesting facts and important information about this important innovation that occured during the presidency of the 6th President of the United States of America. The article on the Horse car provides an overview of one of the innovations of his presidential term in office. For additional info refer to Facts on Industrial Revolution Inventions. The following John Quincy Adams video will give you additional important facts and dates about the political events experienced by the 6th American President whose presidency spanned from March 4, 1825 to March 4, 1829.